You are probably aware of the STP process – segmentation – targeting – positioning. This is an interlinked process, which is the foundation of the development of a firm’s marketing strategy. While the majority of this website is dedicated to creating market segments through the use of cluster analysis – the ultimate success of this process will be judged upon the end selection of a suitable target market and the firm’s ability to successfully compete in that selected segment. Is the segment size large enough in terms of unit sales and revenue? Is the segment still growing and will it provide long-term potential for the firm? Are the unit profit margins attractive, or are margins too tight? Is there a limited degree of competitive rivalry, or are competitors too aggressive? Do we have any competitive advantages to leverage? Do we have sufficient resources (money, manufacturing, team, etc.) to compete long-term? Do we have the ability to access distribution channels (such as retailers and wholesalers)? Is a strong brand needed? And do we have one? How well does this potential new segment fit with our overall marketing strategy? How well do we understand this market segment? Are there alternative, more attractive or less competitive, market segments to consider? How similar and how responsive are the consumers in each of the potential target markets? 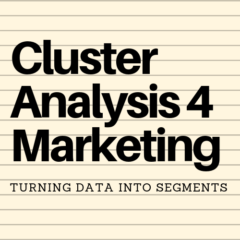 How does the cluster analysis outputs help us? Cluster analysis can only do part of the work – it is mainly designed to help cluster/group related data – it will help us answer some of the above questions, but not all. We will still need to supplement what we have learned from the cluster analysis process with other information. The size of each market segment – as a percentage of the total market. From there, with a little basic information, we can calculate the unit volume size and the revenue size of the segment – which is very important information in making a target market selection decision. The segmentation map shows the “positioning” of the needs of the market segment. This will give us a good understanding of the segment – and if we combine it with a perceptual map (to create a joint space map) – we will be able to determine whether we would be able to construct a successful marketing strategy (based upon the brand’s strengths and capabilities) and whether we have any competitive advantages that we could leverage to be successful in the marketplace. The output of both the central means chart and the summary of the marketing variables by segment are very strong pieces of information that provide us with a great understanding of the market segment that we can use to help develop our marketing strategy. And finally, the various comparison points – of both the marketing variables and the sum of squared error (SSE) – will give us confidence in the appropriate design of the overall market segment structure and help guide us towards the most logical approach to the market for the firm/brand.